How long will my fitting take? Please allow about 45 minutes. Fittings vary in length depending on your needs and how many solutions we try to find the one that's best for you. Why don't you use a "foot scanner?" See the detailed explanation here. What do I need to bring? Your current pair of running/walking shoes and orthotics if you have them. Do I need to make an appointment? No, we do not take appointments. Please keep in mind that there will usually be a short wait on weekends so anytime you can visit during the week is best. I don't run/I don't exercise, can you still help me? Absolutely! Believe it or not, many people we work with are walkers and some are just recovering from surgery, injury, or making the first steps to starting an exercise plan. We are happy to help you find the best shoe for your foot and any special needs. How often should I replace my shoes? Running shoes will last around 300 - 500 miles. The amount of time depends on how frequently you use the shoes. 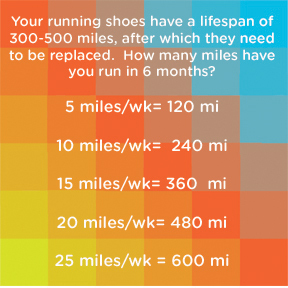 See the chart below for an idea on how many miles you put on your shoes in a 6 month period.